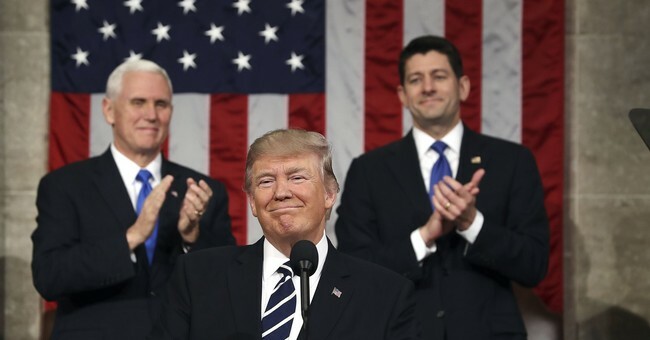 Tonight, President Trump faces an invaluable opportunity to help turn the tide even more significantly in favor of his signature domestic accomplishment. He will speak directly to tens of millions of Americans, many of whom likely still believe -- falsely -- that the new tax law will not benefit them. Trump should juxtapose the fear-mongering nonsense peddled by the opposition with the real-world outcomes that have since been splashed across front pages, day after day. He should enthusiastically highlight the great economic news generated by the corporate side of the reform package, from bonuses to millions of American workers, to expanded operations, to job creation, to enhanced employee benefits, to increased wages. Will Democrats clap for the positive results of a law every single one of them opposed? Or will they sit awkwardly as Republicans cheer indisputable wins for the US economy and America's workforce? Examples Trump could draw upon to make his point are cropping up on a near-daily basis, with Exxon Mobil and Honeywell becoming the latest major companies to hop aboard the bandwagon. Congressman Joe Kennedy tuesday night must explain voting against a median family of 4 in his district getting a $5841 tax cut. It would probably be unwise for Trump to 'punch down' at any of the half-dozen or so Democrats slated to give responses to tonight's speech, but it sure would be fun -- and pretty Trumpy -- to see the president demand that the Dems' official rebutter (another Kennedy, natch) explain why he voted against the interests of his constituents. By the way, I can't vouch for Newt's exact math; I was under the impression that average families' tax cuts would be in the $1,000-$2,000 range (reminder: "the rich" do not disproportionately benefit from the law's tax cuts), but his overall point still stands. Bonus question: Will Trump engage in some obvious and deserved trolling by mentioning the word "crumbs"?